An international artist with works worldwide, from the walls of the Private Art Collection of the IMF in (Washington DC) and into the private homes across Europe, Australia, USA, Africa and Asia. My art represents a deep spiritual connection with nature. Collectors describe my work as abstract realism, experienced with a sense of spirituality. They say, “There is a sense of connecting to something beyond this world.” I feel this to be true. The viewer experiences my work as a feeling of space and mood, instead of cognitively recognizing places or things, yet the subject matter is often found in everyday life. Every piece is an exploration and a discovery of the unexpected. I love colour. I love experimenting with new colour combinations inspired by the natural world. I love the emotional content and reflection found in colour. I love that my process of art-making and colour exploration is a form of meditation, for me and the viewer, giving each of us the chance to connect to our contemplative inner self. When I enter the art making process, time stops. Therein begins a deep healing, an energizing and timeless dreamlike state, induced only by the colour and changing form and texture flowing over the canvas. I watch in wonder as colours blend to form new hues and depths, lights and reflections. I watch as new forms emerge and retract, as Beings from other dimensions dance in and out, and on and off, the canvas. At a point - once I have reached that deepest place of trust - I’m no longer required to be the observer. I move away from being the guided artist. I am asked to look with new eyes and to respond more intuitively. In this moment I am honored to become the creative servant. So you can understand then, that these works are not preconceived. I don’t re-create images from photographs or “real” landscapes, models or still life. Instead my works are formed and evolve into reality as part of a spiritual and intuitive process. I believe the greatest masterpiece of all is a life well lived. I wish to live fully and to connect deeply. I wish to be true to my soul. This is my art. 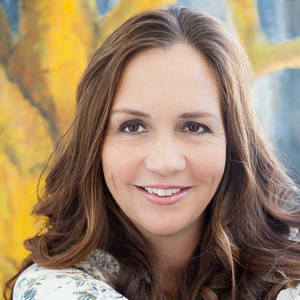 Melanie Meyer, Artist. Endlessly, inspired and taught by nature; held and nurtured by God; awakened and guided by Spirit. As an Artist - essentially self taught. Classes and courses with Michael Pettit, Val Green, Michael Grimley. 15 years an architect running my own architectural practice. The past 10 years discovering my love for the practice in art.